A while ago I took some fall pictured of my girls. And Scrapbooking them in warms my heart. 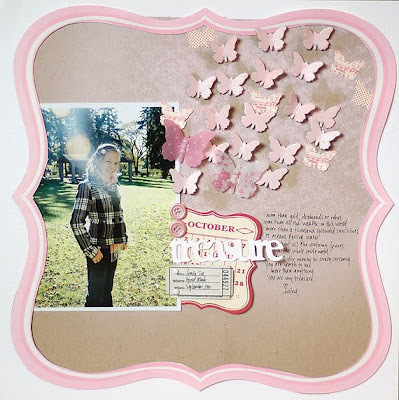 But with this page i chose a colour scheme that's not typical fall colours. The combination of pink and red with the greens and gold in the picture makes my happy! 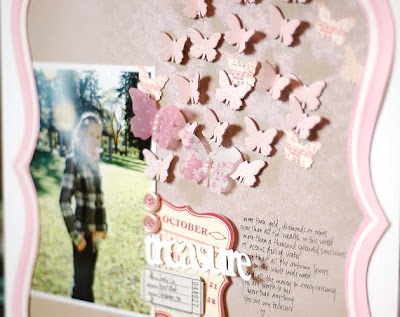 Those little butterflies are Jenni Bowlin's chipboard butterflies and i just laid them out on the page and used pink gloss spray paint to spray them. As always my hot glue gun came in handy adhering the chipboard butterflies. Maybe today is the day to try combinations that you would not usually out together and hopefully you will be delightfully surprised! Beautiful! Thanks for the inspiration Wilna! stunning page love the colour mix. I love thinking out of the box!!! Wonderful work.